BOISE, ID – Stevens-Henager College has partnered with the African Library Project to open a library in Ghana, Africa. We are collecting one-thousand gently used, or new pre-school to 4th grade books. Donations are to be dropped off at Stevens-Henager College, 1444 South Entertainment Ave., 2nd Floor, Boise, ID 83709. The drive will take place until January 31st, 2019. 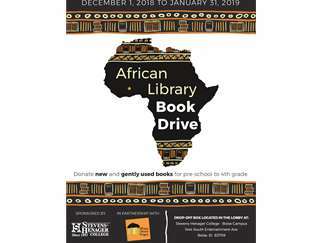 Please support our efforts to make a difference in African families lives by spreading the word of our book drive. You can find us on Facebook, Instagram and Twitter for drive updates @Stevens-Henager.